Adding wood chip mulch around young trees is one of the best things one can do to assure their success. As I’ve mentioned in previous posts, wood chips have a number of benefits. From moderating soil temperature, holding moisture through our dry summers, preventing erosion, to inhibiting weed growth, and eventually decomposing to help build healthy soil. Another function they can serve is to prevent damage to surface roots. The birch tree pictured below looks like it was a victim of an unknowing “mow and blow” landscaping crew. These are the landscape crews that keep a lot of yards looking clean and tidy with straight edges and rounded bushes. One of the main tools in their arsenal is the leaf blower. Besides the noise and air pollution, there’s another reason the use of these machines should be limited in the landscape- soil erosion. Leaf blowers can create wind speeds from 140 to 270 mph (according to Wikipedia), easily strong enough to blow loose soil particles away. I’ve watched numerous landscape crews around Seattle remove weeds (either by hand or with tools) then come through to blow away leaves and other debris with a leaf blower. As the leaves are getting blown away, loosened soil particles are as well. Anyway, back to my photo of the birch tree: repeated soil disturbance and leaf blower usage around the base of this tree has likely lowered the soil level, allowing the roots to be exposed and then damaged by other lawn care equipment. These are likely the structural roots of the tree, the roots that the tree needs for the rest of its life to physically hold it in place. 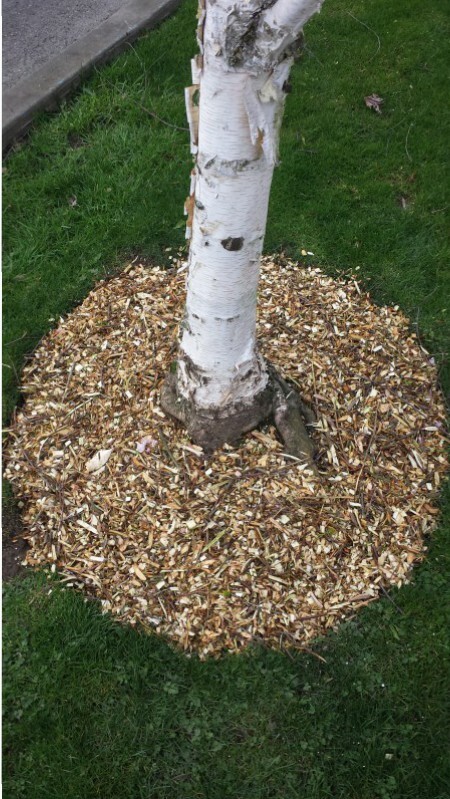 Placing mulch (preferably woodchips, not bark) around the base of trees, but not against the trunk, prevents a lot of potential problems, and benefits the tree in innumerable ways. So get out there and mulch in preparation for our dry summer! 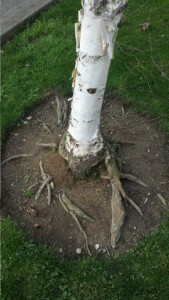 The exposed roots covered with a protective layer of wood chip mulch. This entry was posted in Before & After (photos), Landscapes, Tree Care. Bookmark the permalink.